It’s time to find a new communications solution for your company. Before you start your search, consider this: No two company’s operations are quite the same and different organizations benefit from different types of phone systems. 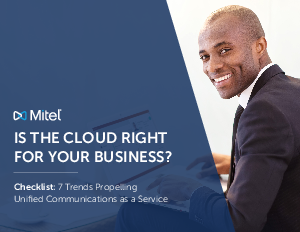 Understanding the factors that are driving many businesses to move their communications to the cloud will help you determine if a cloud communications solution is right for you. Here are seven operational trends propelling today’s move to Unified Communications as a Service (UCaaS). Check off each statement that rings true for your company. The more checks, the more your company will excel in the cloud.